The University of Notre Dame chose SLOAN products as the basis of design for the expansion and renovation of their iconic athletic complex—a decision that is helping the university conserve water, save money, improve hygiene, and pave the way for easy maintenance in the long term. One of the most iconic sporting venues in collegiate athletics, Notre Dame Stadium is not only at the center of Notre Dame’s campus in Indiana, but also the center of the college football universe. Starting in 2014, the university began a 4-year campaign to transform the 88-year-old athletic complex and its surrounding areas into a year-round epicenter for academic and student life. The result was the Campus Crossroads Project (CCP), the largest building initiative in the school’s illustrious history. It was designed to place Notre Dame Stadium at the intersection of research and student life while also serving as an event and hospitality space. A total of 2,105 SLOAN products were specified as part of the CCP, including water closets, urinals, Royal® and ECOS® flushometers, BASYS® and Optima® faucets, and soap dispensers in both new construction and renovations. SLOAN’s Optima sensor faucets (EAF-100 LT ISM) provided water-efficient and hygienic solutions for the majority of the CCP installations. SLOAN’s BASYS (EFX-200) faucets were specified for the remainder of the CCP projects, installed in buildings such as McCourtney Hall, Jenkins/Nanovic Hall, and parts of the stadium. The BASYS faucets have a water flow rate of 0.5 gallons per minute and sensor-based, touch-free operation. These faucets also allowed for above-deck access for maintenance and adjustments. In addition, they have customized, engraved crowns sporting the Notre Dame logo. SLOAN’s ESD-300 soap dispensers were installed throughout the stadium. SLOAN Royal (186-0.125 ESS TMO) sensor urinal flushometers and SU-1009 urinals were installed across each phase of the CCP, delivering water savings and hygienic benefits to the Duncan Student Center, Notre Dame’s music department in O’Neill Hall, and more. The sensor-activated urinal flushometer only uses one eighth of a gallon of water per flush (gpf) and limits false flushes with an eight-second arming time, which together reduce maintenance and operation costs. This type of durability and water conservation are especially critical in high-traffic facilities like the Student Center and the Smith Center for Recreational Sports. 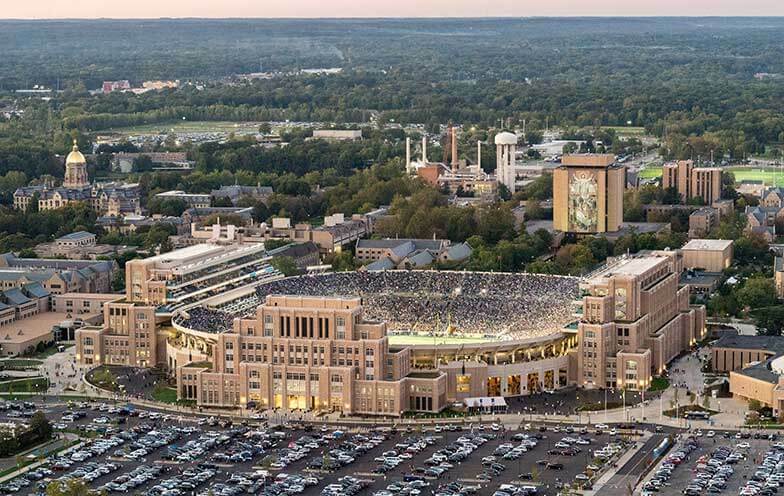 ECOS Dual-Flush Sensor-Activated Flushometers were specified for the third and final phase of the CCP—the renovation of Notre Dame Stadium. Matched with SLOAN’s ST-2459 (wall-hung) and ST-2029 (floor-mounted) water closets, the ECOS 8111 automatically provides 81,000 Fighting Irish fans a full flush (1.6 gpf) or a reduced flush (1.1 gpf), based on the time spent in sensor range, to reduce water use by up to 30 percent. Notre Dame was challenged to keep its vitreous china water closets and urinals clean due to high traffic and the use of well water. SLOAN provided its unique and proprietary SloanTec® Hydrophobic Glaze on all of the fixtures. SloanTec uses nanotechnology to create a liquid-repelling surface that is seven times more effective than other glazes, making it easier to clean—and to keep clean longer. It also eliminated rust stains that had previously been difficult for the Notre Dame janitorial staff to clean. For more information, visit www.sloan.com. 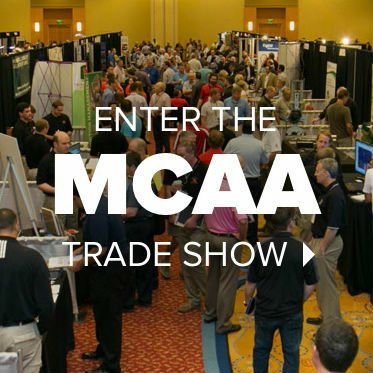 MCAA thanks SLOAN for being a benefactor of MCAA19 and sponsoring Awards of Excellence Speaker Theo Epstein.